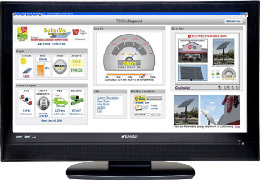 Select wide screen view on a large screen TV in a public area to deliver your message. Update the slideshow using the included WebFilm® to tell a story. 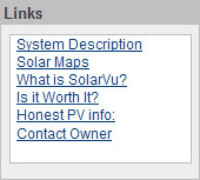 Embed a live plug-in on your company website with a link to this SolarVu® site. Owners can use the plug-in accompanied by suitable text to illustrate their green initiatives. Ideal for schools, lobbies and public spaces. 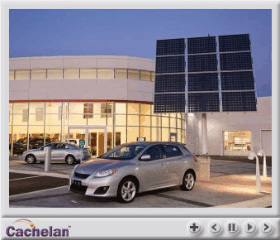 Each site includes a Cachelan WebFilm® CMS (content management system) for displaying a slideshow that can be updated any time. Use it to highlight a business, describe the site or for school projects. 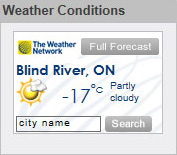 Check local weather conditions and the long range forecast for the area where the site is located from The Weather Network. Links to any website can be added with no programming skills required. Jump to related information sites, videos, company website or other portals for comparison. 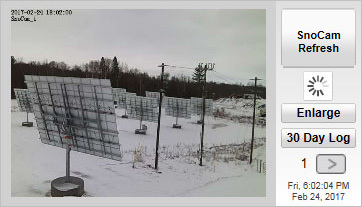 With the SnoCam™ option, each time you visit get a live image of the site. Click the link for a more detailed view or to access lifetime photo records. 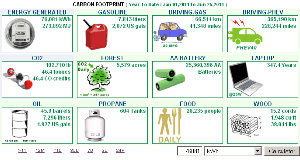 Get a better understanding of sustainability by determining the equivalent savings of common fossil fuel sources from the solar energy generated. Use the template panel to embed a video or other graphics like a map with live links to other locations.